Performance wagons are the securely on the list of items that make our enthusiast hearts go pitter-pat. Sadly, there is a distinct lack of options in this segment, and some of the very best products never make it here to the States. One such long-roof that long ago joined the Forbidden Fruit category is the Audi RS4 Avant, whose successor has been spied racking up the test miles at the Nürburgring this week. We're not entirely sure what's going on under the hood just yet, but with the German automaker's recent remake of its S lineup, we wouldn't be surprised to find a powerful turbocharged mill. 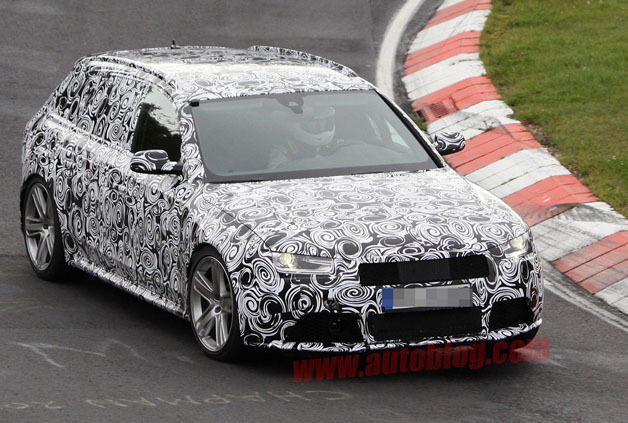 We also won't be surprised to hear the words "Audi RS4 Avant – Europe Only," when the wagon finally sheds its camouflage. Still, we can click through the gallery and pretend that the Nürburgring is actually Laguna Seca. We can dream that our local dealership will have a Dolphin Gray example with our name on it, and we can hope that more performance wagons start to show up on the streets of the North America.